Genus summary: This is a Holarctic genus that is found all across North America. There are approximately 80 species known from North America and approximately 57 in California. Most species are found only in the western United States and many are unique to California. 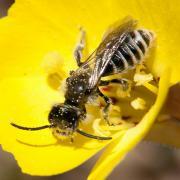 Description: Dufourea (/dew-FOUR-ea/) are small to medium sized 0.14 to 0.44 inches (3.5-11 mm) long, narrow bodied bees. They are usually black, dull green or metallic blue and sometimes, they have a red abdomen. They may have slight bands of pale hair on their abdomen or none. The .antennae on this genus are positioned very low on the head – below the antenna. The clypeus is usually short and wide and the labrum is nearly as long as the clypeus They have two submarginal cells. These bees are diverse morphologically. In particular, they have a lot of variation in their mouth parts. These bees are usually specialists and the variability in their mouthparts is probably related to the different host plants that each species use. Similar insects: Dufourea looks like many other Halictids, particularly members of the genus Lasioglossum. The antennae of Dufourea are much lower on the head than Lasioglossum. 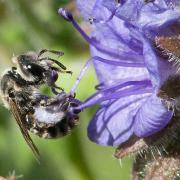 Food sources: Most of the species in this genus are specialist bees. They specialize on a wide variety of different plants including Linanthus, Eschscholzia, Clarkia, Oenothera, Helianthus, Campanula, Calochortus, Monarda, Phacelia, Cryptantha, Mimulus, Cacataceae and various others. Nests: These are ground nesting bees. They appear to have fairly shallow nests. These bees are parasitized by another species of bees and you can sometimes see several parasites hovering above a nest entrance waiting to sneak in and lay an egg in the wall of the cell while it is being provisioned. Flight season: These bees are found from spring to fall.